What I wouldn't give to work for Upper Deck if only for one day. I wouldn't need more than that if it meant I could get the perk of getting its employee-only cards. 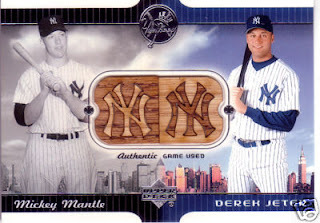 As I looked on eBay for Jeter cards I can't afford, I found two listings for a game-used Derek Jeter/Mickey Mantle bat card. And it uses all the cool words: Laser-infused, NY, Jeter. What more can a girl like me want? But I can't get this card out of a box. Apparently, it was only given out to employees, who enjoyed the card so much they would rather sell it on eBay than stare at it all day long, as I probably would have. P.S. - Check out Ballcardmania's post on the oldest card ever found. It could have nearly been yours for $10 until the owner came to her senses. I don't know how you Yankee fans stay in the hobby. I'd get so frustrated with stuff like that. It's so difficult collecting if you're a Yankee fan. Ha! I wonder if they give them out to employees as a "mystery salary bonus". "Wow! Great! Cool card! So...how much is this worth?" "Beats me. Why don't you list it on eBay and try to find out?" Must be nice to be Upper Deck, when you have so many bat slivers to play with that you can dress 'em up a little and hand them out to everyone on payroll. You want Chipper cards?! Well, you have come to the right place. We have an abundance if you have some Pujols and Jeter's. Yeah, my penny jar hasn't gotten that high yet. So, I can't afford this yet. Being broke and collectin cards is not fun. Wow, an actual "Derk Jeter" card. I noticed that in the copy of the listing. Anyway, its a really sweet card. Mail Day #5 - Robbie Cano Don't Ya Know? What Do We Have Graded? Why does Topps want to break my heart? Say it Ain't So J.C.
2009 Topps Series 1 Baseball Sold Out?